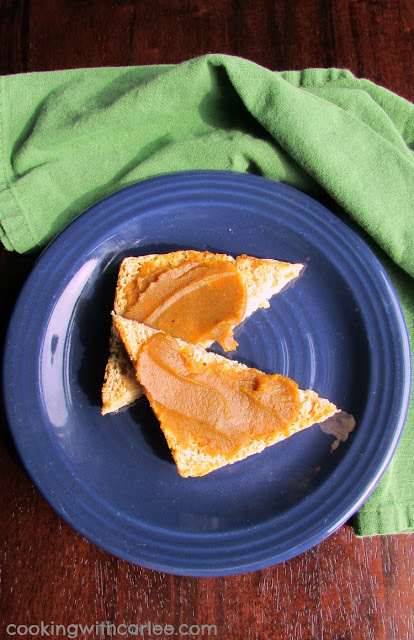 Do you love apple butter? And you love all things pumpkin? Then this is for you! Pumpkin puree is concentrated down into a thick and delicious butter with a hint of maple sweetness. It is perfect for spreading on toast, english muffins, waffles and more and it is perfect for mixing into other recipes. If you are patient, you may just see one such case later in the week. You should definitely come back to check that out! I considered letting the pumpkin puree go for a while in the slow cooker. I know how much you guys like slow cooker recipes and I love to give you what you want, but this comes together so quickly and easily on the stove. There is no reason to lug out the slow cooker and then have to clean out that darn crock. Am I the only one that hates cleaning out the crock? Anyway, back to the matter at hand. I made this batch in my 9" cast iron skillet for two reason. The first is I just love to use my cast iron. It is super versatile and it makes whatever I am making feel just that little bit more authentic. I don't know why. I just love the look and feel. I also love that the thick bottom and even heat distribution allows you to multitask with a little less concern of scorching and craziness. But really, you can use whatever skillet or pot you'd like. Just keep a closer eye on it if you are using a lighter weight pan. Now I am not a canner, so it is not an issue for me, but they do say you should not can pumpkin butter. It isn't acidic enough to ensure food safety. You can however freeze it, my favorite way to "preserve" food. You can also just make it a pint at a time, store it in the fridge, and eat it up! I have a feeling you will find yourself finishing it in no time! What are your favorite fruit butters and what are your favorite uses for them? I'd love to know! In a heavy bottomed pan (I used my 9" cast iron skillet), stir together ingredients starting with a quarter cup of the maple syrup. Cook over medium heat, stirring frequently until the mixture has reduced in volume by about a third (or even by half if using homemade puree). The mixture should take on a rich brown color and should hold its shape when swirled with a spatula. Taste a bit and add more syrup if you'd like for it to be sweeter. Allow to cool then spoon into a clean jar. Store in the refrigerator for up to a couple of weeks or in the freezer for up to a year. Autumn's Savory Pumpkin Cream Pasta with Bratwurst from Kudos Kitchen by Renee. Pumpkin Cornbread from A Kitchen Hoor's Adventures. Pumpkin Milkshake from Cindy's Recipes and Writings. Pumpkin Waffles with Pumpkin Praline Topping from Grumpy's Honeybunch. Carlee how did you read my mind? 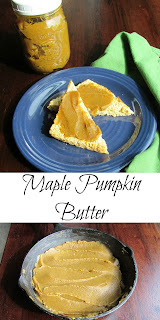 I was just thinking that I would like to try to make a pumpkin butter and this one with the sweet taste of maple sounds fabulous. I just got some of the pumpkin English muffins so I'm gonna make this, I think it'll be a great combo. That would be perfect!! Now I need to look for the English muffins! I am sure that this would go so quickly in my house that canning it would be a moot point. It's a small enough batch that it wouldn't be worth breaking out the canning supplies anyway ;-) Eat it while it's fresh and then make more! I love pumpkin butter, and you just took it to the next level with maple syrup! Yum! I just love those warm flavors together! Thank you! 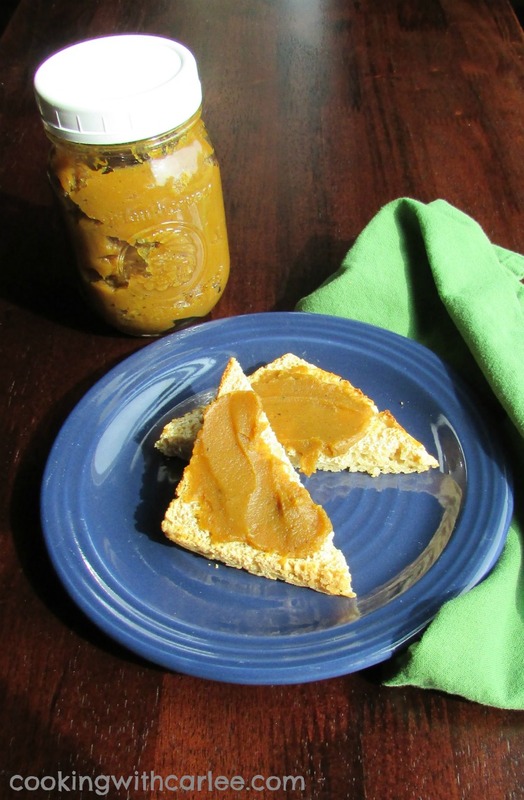 Thanks so much for sharing your awesome Pumpkin Butter with us. Hope you will come back to see us at Full Plate Thursday real soon and have a great week! I'm gonna spread this on everything! 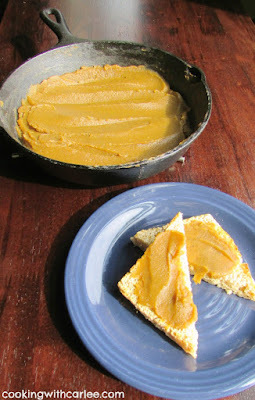 I've never had pumpkin butter...YUM! The slow cooker is so convenient sometimes, but such a pain too!! You definitely need to give this a go!